Aquarium, maker unknown. America, 1890-1910. Cast and wrought iron frame, slate bottom, adhesive and paint. I purchased this aquarium some years ago, entranced by its gilded “hairy paw” feet. It’s a neoclassical aquarium! I dated it between 1890 and 1910, but it may be a bit newer. A 1920s catalog of Cugley and Mullin, a Philadelphia pet store that also did a substantial mail-order business in the mid-Atlantic, offers an aquarium of similar design called the “Chief,” with a green frame and gold striping and feet. This aquarium is small by our standards. Excluding the feet, it is ten inches in height, nine inches in depth and thirteen and one half inches in length and held less than than five gallons of water. While somewhat larger vessels were available, most home aquariums were small and and held only a few animals. The ideal was to have a “balanced” aquarium — that is, the plants and animals had to create equilibrium, with the plants producing enough oxygen to sustain the small pond fish or goldfish that were the denizens until the late 1920s, and the carbon dioxide produced by the animals supporting the plants. Aquarium and flower stand, 1876. Made by the Racine Hardware Company, Racine, Wisconsin. 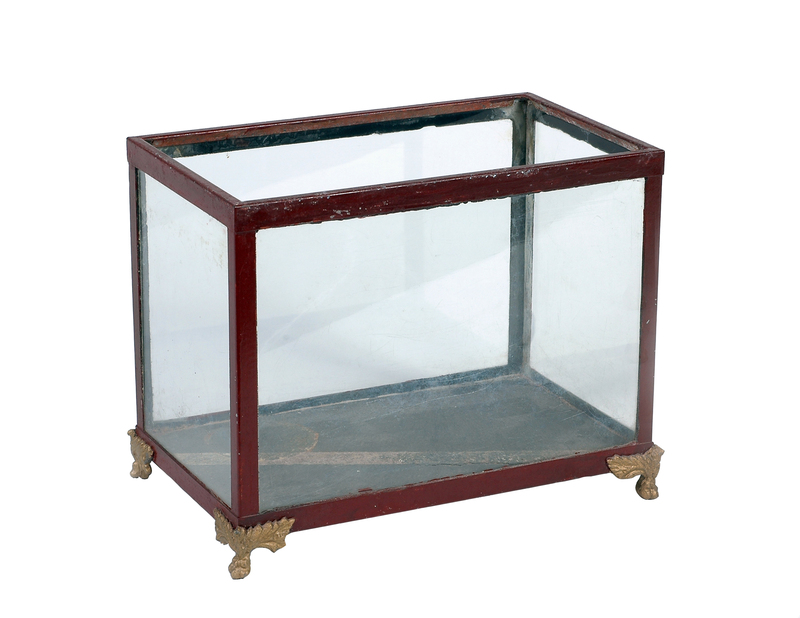 The concept of the balanced aquarium appeared in the late 1850s. (I discuss the idea in more detail in Pets in America.) 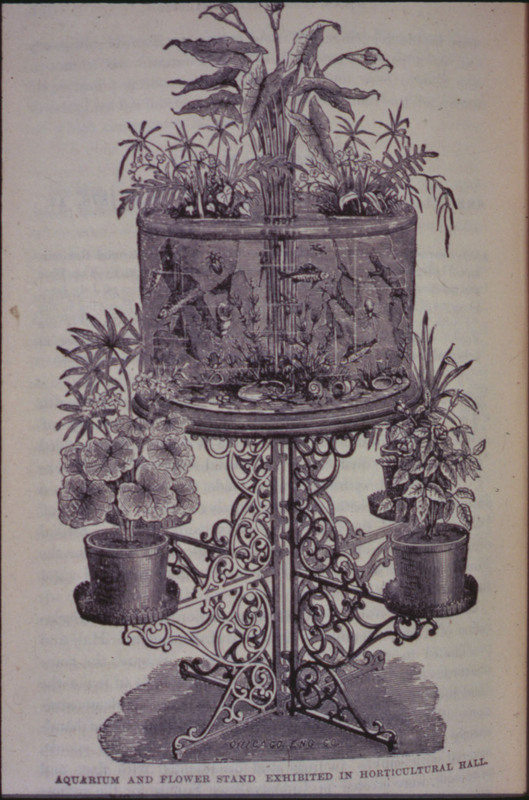 Here is an image of a balanced aquarium and plant stand exhibited at the Centennial in 1876. The artist who made this image took a certain amount of poetic license with the interior of the aquarium; there are too many fish to survive, even with the abundance of water plants emerging from the top of the round glass fishbowl. The requirements for “balance” set the limits of the home aquarium until the 1920s, when the small electric-powered pump first appeared on the scene. Its invention coincided with the appearance in general pet shops of the first tropical fish — guppies, platys and a few other types. These freshwater animals needed more oxygen than did goldfish, who were, and are, notable for their ability to survive in less-than-ideal conditions. Aquariums like mine were parlor ornaments, as the trade card for Dr. Morse’s Indian Root Pills suggests. 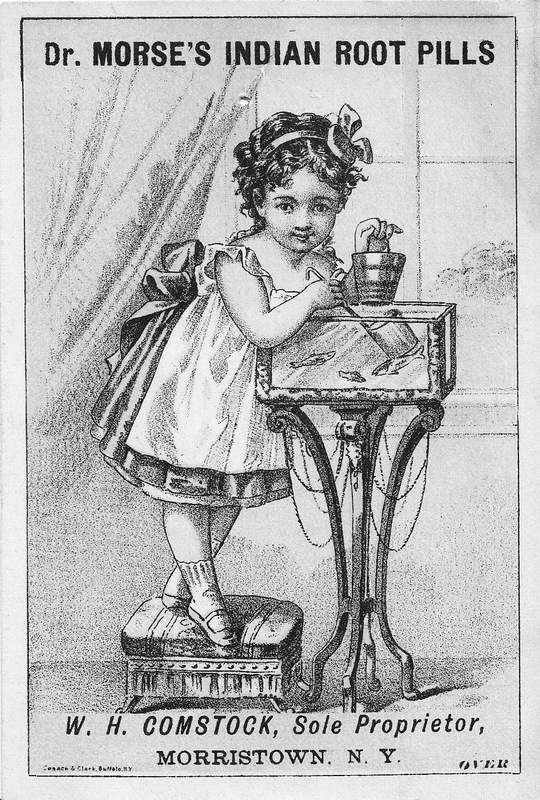 Apart from the elaborate aquarium stand ornamented with chains, what’s interesting about this little picture is the equipment being used by the little girl: the tin scoop with a long handle and small bucket. These kinds of items — essential equipment for the home aquarist — don’t survive in collections today, as far as I know. Advertising trade card for Dr. Morse’s Indian Root Pills, lithograph, ca. 1880. Published by Cosach (?) & Clark, Buffalo, New York. That’s so interesting! And the aquarium itself is beautiful. I’d never thought about how aquariums all started and the such.